Tough As Nails: Female Scientists Rise Up In Nigeria : Goats and Soda Working as a professor isn't an easy job anywhere. But try doing innovative research with only four hours of electricity a day, no access to the Internet and hostility from male colleagues. Four hours. That's how much time physicist Rabia Salihu Sa'id has each day to get her research done at Bayero University in Kano, Nigeria. "Each day, my university is giving me only four hours of electricity. I can't do research in four hours!" Sa'id says, laughing, despite her frustration. She studies how deforestation may change air temperatures in Nigeria. Computing power is essential for her research. "Think! You are concentrating and the power goes off! You try to use the battery, and the battery starts beeping. Then you have to close it and leave," she says. "The ideas are gone by the time you come back. It's difficult — you have to start all over again." Working as a professor isn't an easy job anywhere. But scientists in many low-income countries, such as Nigeria, cope with problems unheard of elsewhere. Universities commonly lack the funds to support research, while students have no access to computers or the Internet. Despite such slings and arrows, good science does get done in poor countries. And done by women, such as Sa'id. 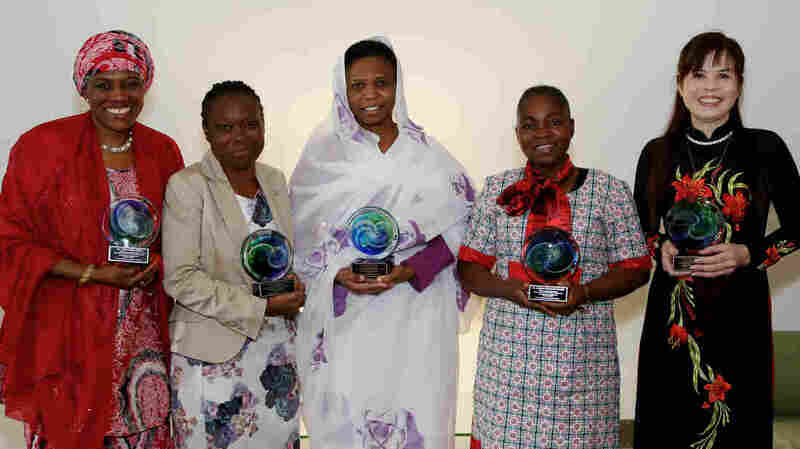 Women make up only about 14 percent of Nigerian academics but account for about a quarter of the science and technology professors — the latter statistic is roughly inline with the percentage in the U.S.
Three of the top female scientists from Nigeria, including Sa'id, won an award Saturday at the annual meeting of the American Association for Advancement of Science in San Jose, Calif. Sitting around a table during the conference, the women swapped experiences and shared common frustrations. Many times they sounded just like female scientists in the U.S. They strive to get money for students, to do innovative research under tight funds and to receive support from male colleagues. "I don't think they were very happy in my department when I got the award," Sa'id says about her male colleagues back home. When she showed one of them her award letter, he asked if the award was specifically for women. She said it was. "And he just shook his head and walked away — as if that's the only reason I got it!" "There is always some hostility," says Dolly Ighoroje, a physiologist at the University of Benin in Nigeria. "I don't know if it is because they feel threatened or envious or something because as far as they are concerned, they are the boss." But some of these women's struggles make problems in the West look small. Take for instance Mojisola Oluwayemisi Adeniyi's experiences at the University of Ibadan. Like Sa'id, Adeniyi is a physicist. Her goal is to understand how future climate conditions in Nigeria will affect the country's ability to grow food. This type of research requires massive computing power — think a room filled with computers for her students to run climate models. Adeniyi has only one laptop. But that doesn't stop her. "Presently I improvise," she says. Adeniyi uses her own laptop, outfitted with eight processing cores and climate modeling software, which she copied at a conference. "If you tell someone I am running regional climate model on a laptop," she says, "they'd find it unbelievable — but I do it." Adeniyi's dream is a computer room for her students. But she doesn't have the money to buy the machines. Lack of funds, in general, seems to be a problem for many scientists in Nigeria. Many even have to use personal money to fund their research. When Mojisola Usikalu was working to get her master's degree in physics, she used her salary as a schoolteacher to pay for samples to be analyzed. She studies how radiation can affect plants and animals. "The professor I went to said my data were very good," Usikalu says. "He encouraged me and said, 'You can do more than this.' From that point, I said to myself, 'OK, there are good opportunities in the sciences. If I just do good work, maybe I can get somewhere.' "
Usikalu believes that with a little doggedness and a little help from time to time, anything is possible. The professor recommended her for a doctoral fellowship. Now she's a lecturer at Covenant University in Ota, Nigeria. "I always try to motivate the students — especially the girls," she says. "I tell them, 'There is no barrier. There is nothing that can keep one from good success in science if one is passionate about it, determined and focused. One can get to any level.' "
Like in the U.S., girls in Nigeria tend to drop of science as they get older, Adeniyi says. "It's in secondary school that boys and girls begin segregating," she says. "Girls start thinking math and physics is hard. It's not feminine. But if people like us can go there and talk to them, showing them what we have achieved, telling them they can do well in those subjects, they will surely be encouraged."